GOLD PRICES fell again but were outpaced by silver in London on Thursday, while platinum dropped to new 14-year lows as the surging US Dollar pushed industrial commodities lower. Asian stock markets slipped as the Chinese Yuan also fell to new 12-month lows, tracking the slide in Dollar gold prices. European shares fell 0.5% as the Euro dropped to its weakest Dollar value so far this month. Gold has now lost 2.2% versus the Dollar since last weekend. Silver has fallen harder, dropping 3.3% for the week so far to come within 25 cents of July 2017’s sixteen-month low this morning at $15.24 per ounce – down almost 10% for 2018 to date. Platinum prices have fallen harder still, losing 3.5% this week alone to fall below $800 per ounce for the second time this month in London trade Thursday. 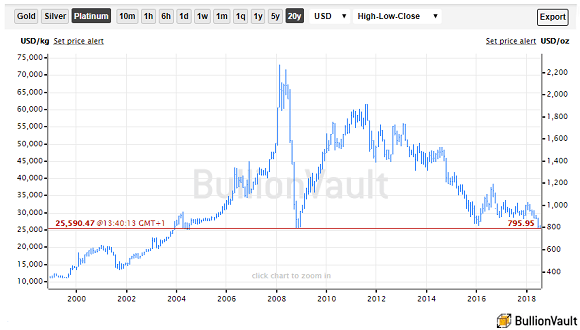 Platinum was last this cheap in July 2004. “In South Africa, the government will not let you cut shafts,” agrees portfolio manager Johny Lambridis at insurance giant Prudential’s South African investment arm, while on the demand side, European car-drivers are moving away from diesel vehicles – source for 40% of annual offtake in the form of catalysts to cut harmful emissions. “We don’t have growth in [the] number of vehicles and effectively all you are doing [is] taking one catalytic converter [and] recycling it. Last month saw diesel vehicles account for 37% of new car sales in Western European, the consultancy says, quoting data from specialists LMC Automotive. In June last year that figure was 45%. Wednesday’s pause in the slump in precious metal prices saw the major gold and silver-backed ETF trust funds end the day unchanged in size. The giant SPDR Gold Trust (NYSEArca:GLD) remains the smallest since last August, needing 794 tonnes of bullion to back its shares. The iShares Silver Trust (NYSEArca:SLV) has in contrast swollen to its largest in 11 months as metal prices have fallen, needing almost 11,165 tonnes of bullion backing. Industrial silver demand is booming in India, Bloomberg reports today, driving imports higher while gold jewelry demand struggles during the typically quieter summer months. No.5 gold consumer nation Turkey yesterday ended its state of emergency two years after a failed coup attempt blamed on supporters of cleric Fethullah Gülen, and marked this week with a huge rally in Istanbul. New anti-terror laws are now planned to replace those emergency powers. President Recep Tayyip Erdoğan today filed a criminal complaint against 73 opposition politicians for sharing a cartoon about him on Twitter in support of university students arrested for carrying the picture on a placard.